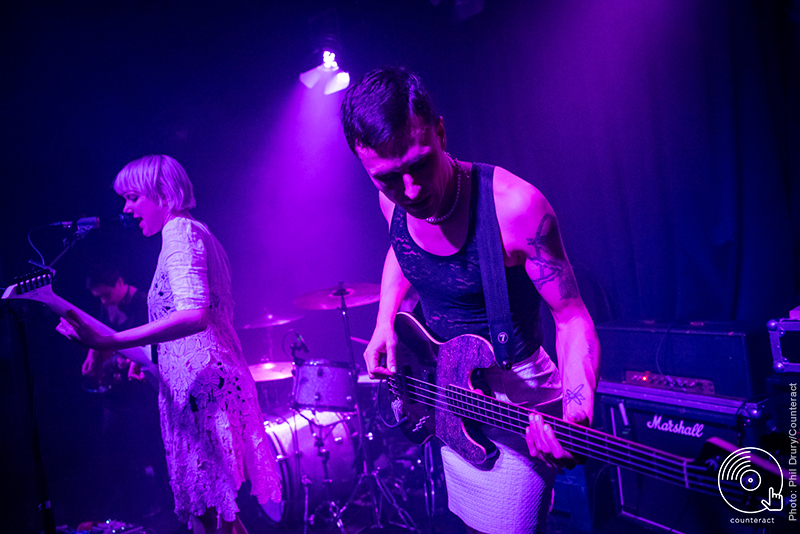 Toronto’s Dilly Dally gripped the Hare & Hounds on January 29th, showering an eager crowd with fiery riffs and screeched vocals from their late 2018 album ‘Heaven’. First on the bill, hailing from Bristol, are “dual-fronted three-piece” Sœur. As soon as they take the stage, the dynamic between frontwomen Tina and Anya is something really fascinating. The two take turns singing different parts before impressively overlapping their unique tones to create beautiful harmonies and a killer atmosphere. Tina’s voice fills the bright, sweet side of the mix whilst Anya has a darker snarl and croon to her voice, comparable to a young Stevie Nicks at times. This impressive feature does not overshadow their instrumentation however, as their respective grungy guitar work blows the audience away. Drummer Jim also gets his moments to shine, with complex math-rock moments really allowing him to show off his awesome timing and execution. An impressive and memorable start to the night. Hotel Lux follow shorly after, providing an immediately very different vibe. Alcohol soaked, political, matter of fact punk. Clad almost entirely in creased vintage, and sporting bowl haircuts, they look and sound like something you might have seen in the early 90s at a working men’s club. As their set begins, the room is stunned by a Phoenix Nights-esque brand of surreal, run-down Britishness. Twisted yet upbeat organ synthesizer mounted garishly against a ska and punk flavoured backdrop. 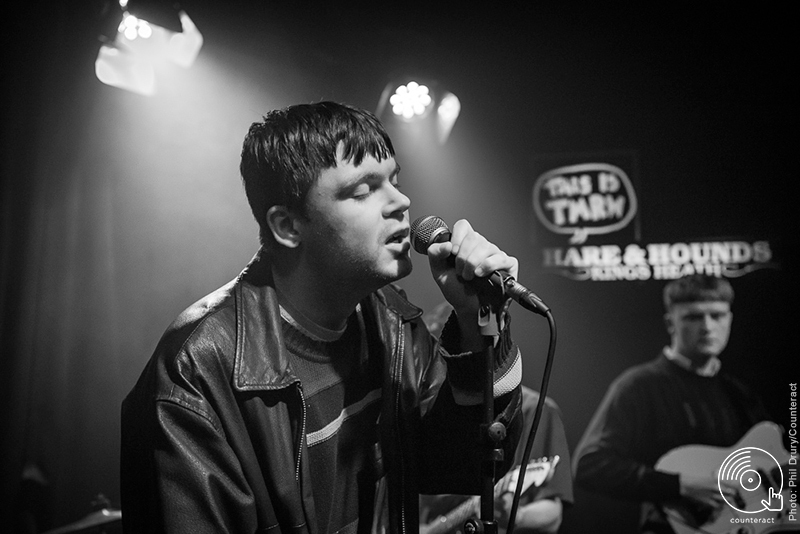 The vocalist delivers his bleak lyrics in a groan, comparable to those of The Clash, or Protomartyr and Parquet Courts in more recent years. Casual mentions are made to Danny Dyer and Brexit. It rapidly becomes clear that this band is not for everyone, as some of the crowd look on with a glazed and confused expression, but certain spots of the crowd really dig it the performance. Overall an extremely memorable performance, with solid playing all round and a unique vibe is sure to keep some people coming back for more. 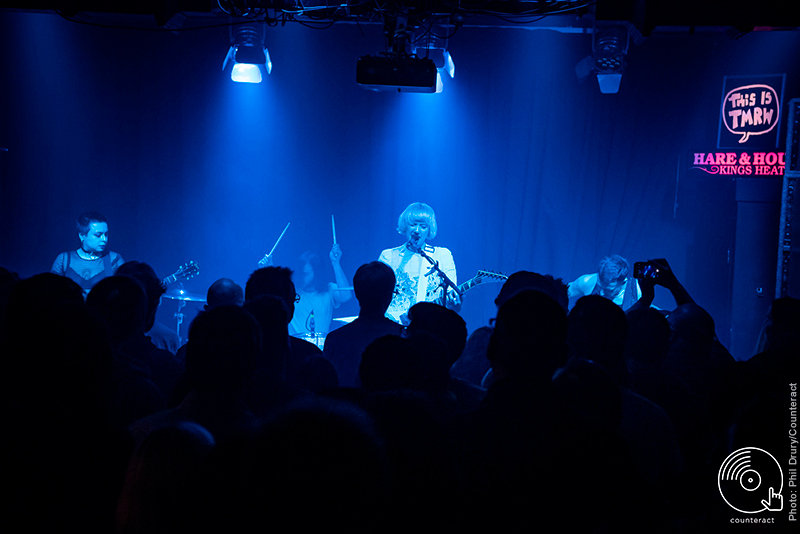 Dilly Dally softly make their way onto the stage, wandering through the crowd with their instruments and setting up quietly. 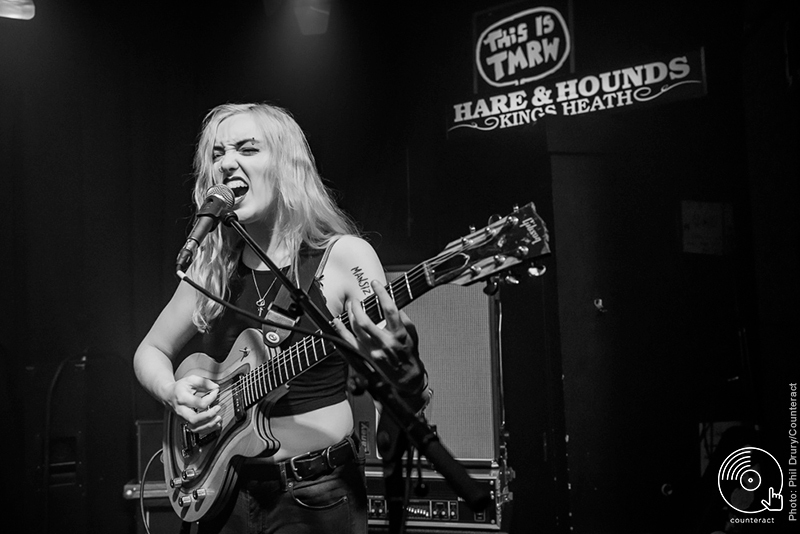 Frontwoman Katie Monks removes what looks like a black velvet cloak, and blasts away any expectation of softness with a face-melting tone from her white Flying V guitar. Her signature screeched vocals soon match the volume of the guitars, alongside massively energetic playing from Jimmy Tony (bass) and Benjamin Reinhartz (drums). Liz Ball joins in with further guitar work and the collective sound is really something to be admired. The huge, grungy guitar tones and high pitched vocals evoke a massive Smashing Pumpkins vibe, although Katie’s harsh yet sweet vocals might overshadow even Billy Corgan’s recognisable timbre. As the set continues, and fan favourites like “Desire” and the new “Sober Hotel” force the crowd to bang their heads in blissful unison, Jimmy and Benjamin really work themselves into a frantic sweat, and it only helps the crowd to get going even harder. Towards the end of the set there is a small technical hiccup which Katie troubleshoots along with their sound guy. Eventually it gets sorted and they finish out their set in style. 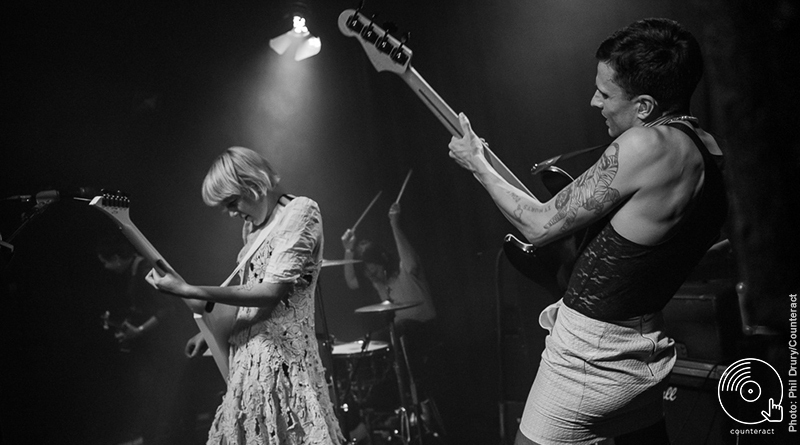 Dilly Dally capture a beautiful balance between tragic melancholia and shredding force, and this is mirrored in the crowd as fans are either gently swaying or violently headbanging. An awesome performance from this Canadian four-piece, and an unforgettable night for Kings Heath’s legendary Hare & Hounds.